We all know that it is a good idea to prioritize our savings accounts. Yet, more than 7 out of 10 Americans live paycheck-to-paycheck (in this article, it was almost 8 out of 10!) and would experience major financial complications from one missed paycheck. I used to live this way. In addition to the expected financial challenges, my poor money management skills carried stress into every facet of my life. If I had known all of the non-financial benefits of prioritizing the establishment of financial margin, I’m convinced I would have avoided a lot of unnecessary stress. Perhaps by sharing these benefits in this series of posts, I can help give someone the final nudge needed to begin to prioritize saving money. Have you ever had to park a car in a garage that had a narrow entrance? An garage entrance so tight that you feared that you would knock both mirrors off of the car each time you tried to park in it? As a result, you approached the entrance very slowly and cautiously. If you had to park in a garage with a double door entrance, you could screech in at 30 mph and still safely make it into the entrance. This is exactly the case with financial margin! Without financial margin, a person is forced to proceed with great caution for fear of making a major financial error. One misstep and there will be financial damage! With a lot of savings, you are able to move more freely and with greater speed. This is a wonderful benefit! Have you ever noticed that people with money tend to get the better financial deals? They are the ones who purchase a house, business, land, and investment at a major discount. Why? Because they had money ready to do the deal! They had margin! Back when I was broke without financial margin, I attempted to purchase a business. Think about that statement for a minute. I tried to purchase a business without any money. Do you think I was successful? Absolutely not! They looked at me incredulously and laughed me out of the building. I resolved to get better instead of bitter. Flash forward to six years later. I had indeed gotten better by prioritizing financial margin, and I found a farm for sale at a steep discount (it was in the middle of the Great Recession). Because of margin, I was able to close on the deal in 11 days from the date I first walked on the land. Speed. Enabled by financial margin. Ready to take your finances to the next level? 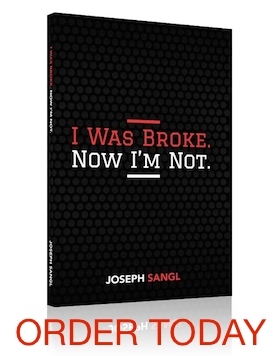 Get your copy of I Was Broke. Now I’m Not. and get started on your path to a fully funded life!